Amnesia is among the most common RPG tropes today. It’s a tried and true feature that tends to make RPG fans either mildly amused or just sigh in disappointment. It’s not necessarily a bad thing to have in a game, it’s just been used to the point where many consider it a tired plot mechanic. More often than not, a game that relies on it fails to excitingly build upon it in any way. But then we have The Longest Five Minutes, which aims to give the amnesiac trope one of Sabin’s Suplexes by turning it completely on its head. In that aspect alone, The Longest Five Minutes is highly successful, putting a fresh spin on an otherwise overused plot point. Yes, you are the hero and indeed, your character has amnesia. 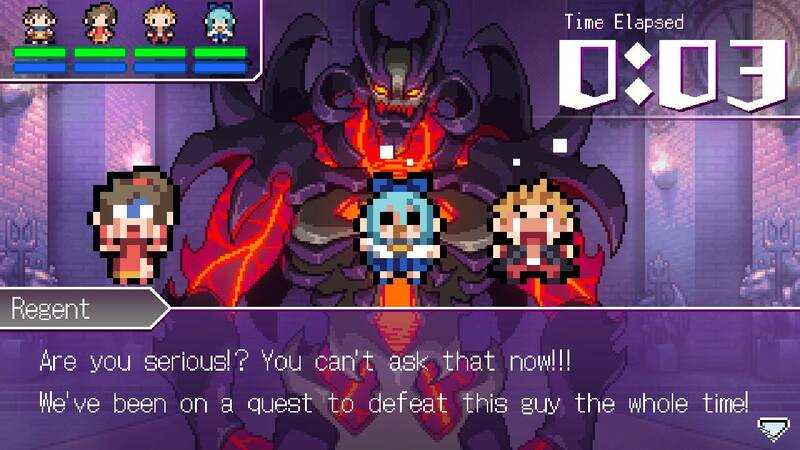 As a matter of fact, he and three companions are on a trip to defeat the ultimate baddie as well! The separation from the norm occurs via the exact point at which you lose your memory. Flash Back (I see what you did there) and his cohorts have come face-to-face with the Demon King, whom they believe is responsible for a mysterious fog that claims the lives of all things (including inanimate objects); turning them into demons. At that moment, Flash Back does what can only be described as the equivalent of when Peter Griffin’s band didn’t know any songs. You literally forget everything, and spend the next five (albeit long) minutes figuring out everything from who your partners are to the story behind the sword you are wielding, and everything in between. 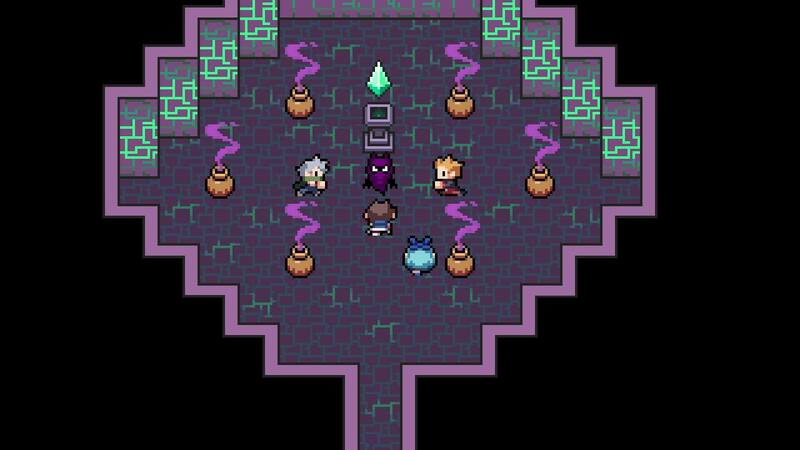 The Demon King, mind you, does not take any breaks while you figure out what is going on. He relentlessly assaults your group while you flash in and out of past events in a desperate attempt to piece together what happened leading up to this point. The whole ordeal is fascinating because that game manages to be serious enough while not being overly so. The Longest Five Minutes manages to use a lot of common RPG story bits (a fabled sword, amnesia, the “hero”, etc…) that would make it difficult for some genre veterans to take seriously, but successfully executes it by way of well designed characters. The dialogue between you, the party members, and the Demon King himself in The Longest Five Minutes is akin to encountering Giygas at the end of Earthbound. Don’t get me wrong; the Demon King definitely lacks the same psychological prowess as Giygas (still scarred by that fight), but they are certainly in the same vein with the sense of emotion that they can stir within you. He will leave you questioning your decisions while mocking you at every opportunity, but not in an overly cheesy manner. Simply put, the writing is well done, and I am honestly impressed at what the developer achieved given the underlying, common story mechanics. 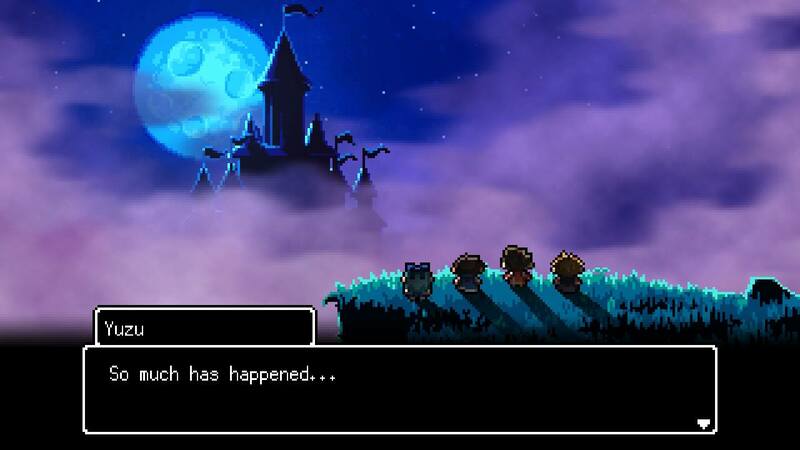 The Longest Five Minutes incorporates an Earthbound-ish style to its world and characters while putting its own spin on things. The pixel art itself is done well enough but is definitely not going to be everyone’s cup of tea. Those looking for super-stylized, highly shaded/detailed graphics will not be satisfied. 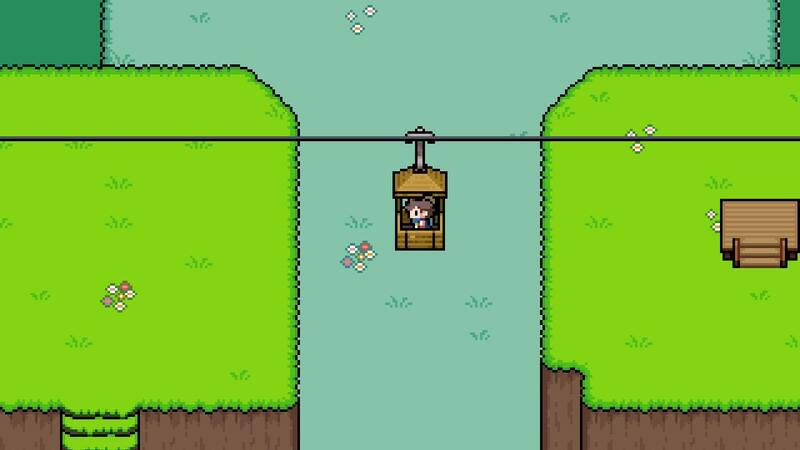 Again, we are talking about an Earthbound-like game, which favors simplicity over complexity in most cases. I would say that the simple graphical approach actually works in the game’s favor over a more highly-defined look because it makes the often lighthearted NPC exchanges more believable. Speaking of NPCs, they range from your staple old man to the masked luchador, and there are tons of them to interact with in each locale you visit. To a certain point, it feels like there may be too much interaction given how the rest of the game is laid out, but that is more of an observation rather than an actual complaint. The only time I feel that the simple graphical approach works against the game is during the final few dungeons. Most of these tend to be much longer than the previous ones, but don’t make up for it in terms of design. A barebones dungeon with limited props is okay by me if it doesn’t take long to traverse. In the longer ones, the lack of foliage and interesting dungeon structure (ie. jagged or curved walls instead of perfectly straight corridors) becomes quite apparent. Luckily, The Longest Five Minutes’ soundtrack is incredible and makes these moments a little more palpable. So far, The Longest Five Minutes earns some major points for plot and the overall look and feel of the world. Unfortunately, that is where the positives end for me. Due to the game’s premise, it throws some of the usual RPG mechanics such as economy, and to a certain extent gear progression, out the window. Instead of having a clear path from point A to point B through the entire game, sections of the game are segregated into memories which you dive into during your encounter with the Demon King. Your items, gear, and money are not carried over across these memories. Imagine playing through the scenarios from Final Fantasy VI but progress in each of them not saving once your allies all reunite. Or, think of the individual character stories from Saga Frontier but on a much smaller scale. In The Longest Five Minutes, each memory you play is its own, separate instance. The exception to the carry-over rule is what is called re-experience. This is basically a level up system in most games. Each memory actually has a set level cap for your characters and does not digress from it. 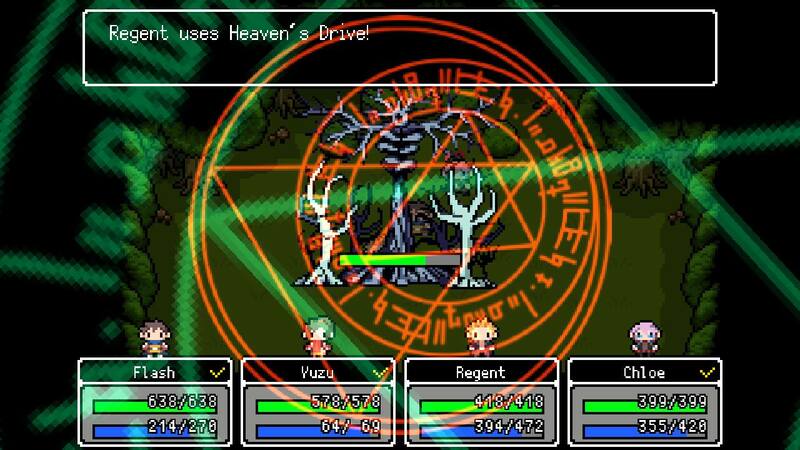 The workaround is re-experience, where you gain re-levels from the usual avenues like killing monsters. These DO carry over to other memories, making your team slightly stronger for it. The issue is that these bonuses tend to be trivial, especially when your character’s level cap is at high levels in later memories. That, in addition to the already trivial difficulty makes it kind of a useless feature in the first place. Let’s dive further into the difficulty for a moment. There is none, zero, zilch in The Longest Five Minutes. 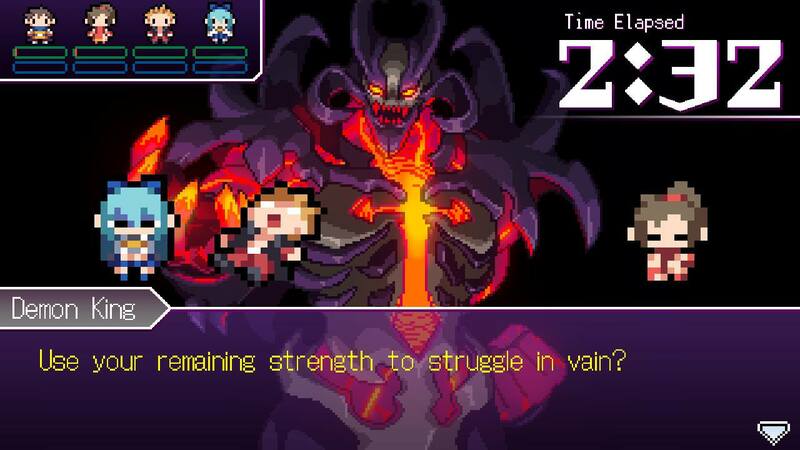 Every random encounter can be defeated by your standard attacks. The majority of boss fights do not change up the formula either, outside of some spot healing here and there. 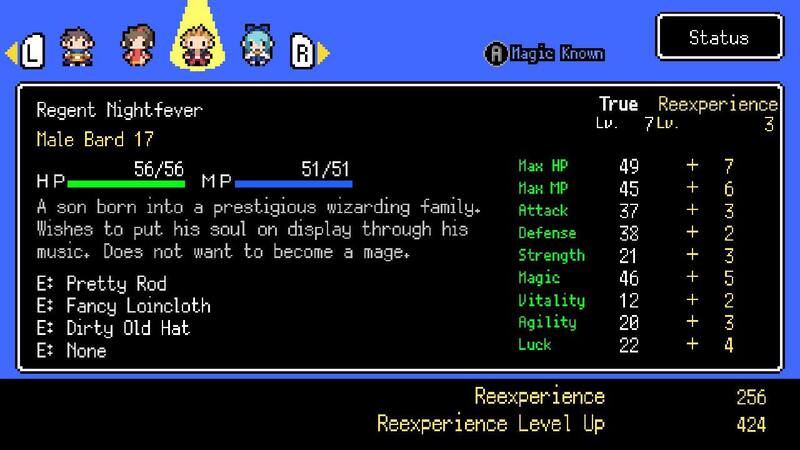 The later boss encounters can be taken down faster with your strongest attacks, but really could be defeated with your basic attacks as long as you were throwing out heals every now and then. Strong abilities and heals are hilarious to use because they can be spammed with no consequence due to your large MP pool, further trivializing content. I’m not saying that every game should be difficult, but there needs to be something in place for it not to become plain boring. Once I learned the ability to avoid encounters, I used it for the rest of the game as to avoid the issue altogether. The lack of any difficulty and pointlessness of currency completely killed my desire to buy-in to these systems. There are shops aplenty in each of the many towns you will visit over the course of the game. Sadly, these are more like cosmetic pieces rather than useful, functioning structures. Sure, you can buy stuff from them, but it’s a moot point. Each memory starts you out with a certain amount of money, which can be used for whatever you want. You can also earn a small amount of dough through random encounters, but why bother? As mentioned earlier, your gear and consumables do not carry over to other memories. In the absence of difficulty, you will never find a need for consumables or for upgraded gear. Treasure chests in dungeons often contain new gear anyways, so there’s really no need to use shop at all. What you will be using a lot of money on is the game itself, coming in at a whopping $40USD as of this review. Considering you will be finished up with almost everything in around 10 hours, it’s quite an expensive price in my opinion. In the game’s defense, it does offer branching story paths, encouraging either multiple playthroughs or the use of an interesting replay mechanic in-game. For a game that encourages replayability though, it fails to actually incentivize its use due to how poor some of the systems are in the first place. Why would I want to play a game multiple times that offers no real compelling gameplay? Some may take the whole non-grinding, anti-money, null-gear progression approach wholeheartedly and embrace it simply for being “fresh.” With the way the memory system works, I’m not saying that there is a better solution for the problems I mentioned. Really, I cannot think of a way to fix these things myself. But it doesn’t change the fact that The Longest Five Minutes just isn’t really fun to play. As solely a story and visual piece, the game is quite pleasant and I applaud them for breaking the mold there. However, systematically it falls short in almost every way. Again, this is largely due to their approach of the story and mechanics surrounding it. Perhaps The Longest Five Minutes is just too ambitious for its own good. Allowing the story and its delivery devices to transcend beyond the usual at the expense of the other features just doesn’t really work here for me.